Happy Friday! What are your plans for the weekend? Its finally starting to feel like Fall in Georgia! The temperature is dropping and I'm frequently in the mood for cuddling on the couch with a cup of marshmallow hot chocolate! I can now style my fall/winter items that have been sitting in my closet since I started shopping early. 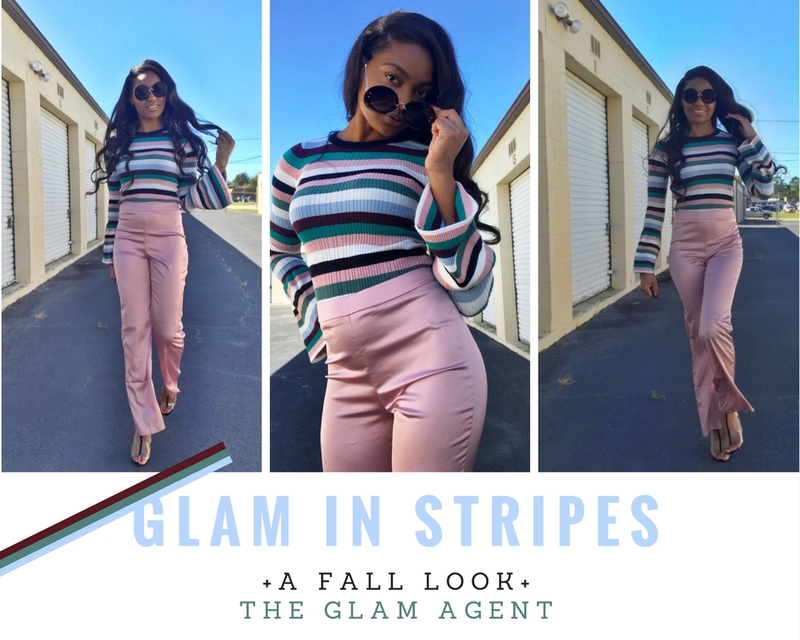 Today's post is an outfit post and I will be giving you details on this look I call "Glam In Stripes"! I named it this because it gives me glam vibes but is also warm and cozy. This top is definitely a statement maker. It's eye-catching, to say the least, and this is one of the reasons why I purchased it. It is a sweater with colorful stripes. Pastel green, blue, and pinks make for a soft vibe along with the burgundy, black, and white adding some depth to it. It is very comfortable to wear and easy to match up with anything I chose to wear with it. It is very complementing and can bring any look together. The sleeves..Oh, the sleeves! Flare sleeves are everywhere & this is one trend that I just can't pass up. It's so me, it's so chic, classy, and glam! The trumpet sleeves add a dramatic vibe to any look and can be worn day and night! I was skeptical about pairing these silk pants with this top at first because of the dramatic difference in texture but you know me, I said what the heck..it looks perfect together. There aren't any rules in fashion but the ones we make ourselves! These pants are so so amazing and comfortable! The color is that of a salmon pink hue and you can't go wrong with such a beautiful color like that. The fit is snug but not to snug. Just enough to highlight my curves for a lady-like look. Keep it classy! These pants aren't flared but they're also not super straight legged either so that's good too for this look. I don't want to over-do the flare trend! Balance. I tucked the sweater into these pants for an effortless look. Magnificent! This look really came together for me in every way! These heels added the perfect touch to the look and finished it off for me. It is a block heel with a lucite covering. I just really love that the heel on this isn't too, too high. I can't think of any other shoe that would have looked better for this outfit.